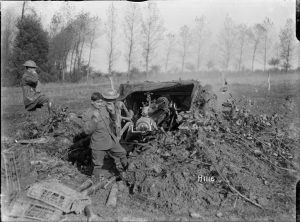 The battle of Le Quesnoy on 4th November 1918 was the last battle fought by the New Zealand expeditionary force. 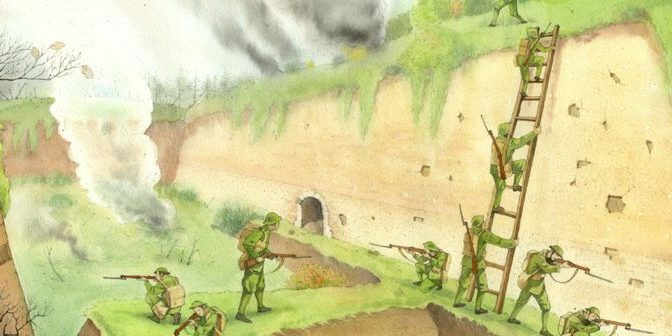 It is commemorated in New Zealand and France as a successful operation in which the New Zealanders advanced ten miles, captured 2,000 prisoners and 60 field guns and liberated the fortified town of Le Quesnoy (pronounced Ken-Wah by its residents). 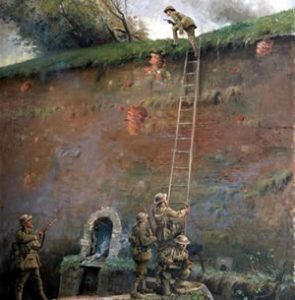 In a dramatic climax to the operation New Zealander soldiers stormed the ancient ramparts with scaling ladders. British media coverage of the lead up to the centenary of the Armistice of November 1918 is dominated by stories of the sadness of soldiers who died shortly before the end of the War. Yet this misses a key point. Had these soldiers not fought with determination to the end, the war might not have ended when it did. Until July 1918 most people on the allied side thought the war would continue until at least 1919. After the battles of July and August an increasing number of soldiers, from Foch and Haig down, thought victory might be possible in 1918. The efforts of the New Zealanders at Le Quesnoy deserves commemoration as much as the death of, say, Wilfred Owen, and other soldiers who fought on. New Zealand military historian, and sometime Christopher Pugsley had written a new book about this action. 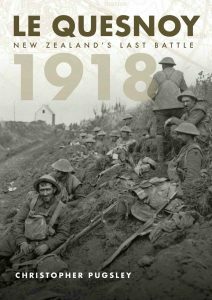 Le Quesnoy, New Zealand’s Last Battle 1918, Oratia ISBN: 978-0-947506-49-0 As might be expected of an ex infantry officer and Sandhurst Lecturer, it is very well written account of this important engagement. It is impeccably sourced from the New Zealand perspective, reconciling inconsistencies in the official accounts and flavoured with personal stories from veterans. The book includes a chapter on the organisation and character of the New Zealand Division. It is well illustrated with clear maps and diagrams. The OP is off to Le Quesnoy in the next week with Spirit of Remembrance’s Armistice Tour armed with Pugsley’s book.